Early Revenue History of Bengal and the Fifth Report, 1812 was the outcome of a series of four lectures delivered at the Dacca College by the distinguished Bengali civil servant, F.D. Ascoli. It embodies the text of the Fifth Report on the affairs of the East India Company by the Select Committee of the House of Commons, appointed with a view to form the charter of 1813, and also careful and detailed summary of the discussions that led up to Lord Cornwallis's Permanent Revenue Settlement of Bengal (including Behar). The condensed arguments of Mr. James Grant, Sir John Shore and Lord Cornwallis on the subject of the Permanent Settlement enable us to see the objectives desired for in the Permanent Revenue Settlement. The book also affords valuable glimpses on the methods adopted for carrying out the settlement and working it successfully in the early days when the zamindars themselves did not look upon it as a boon, and the sale of estates for arrears were frequent. Ascoli's excellent and dispassionate account of the Company’s difficulties and the unsuccessful remedies that were from time to time applied to meet them, disposes of pet theories that are sometimes advanced with regard to the Permanent Settlement. 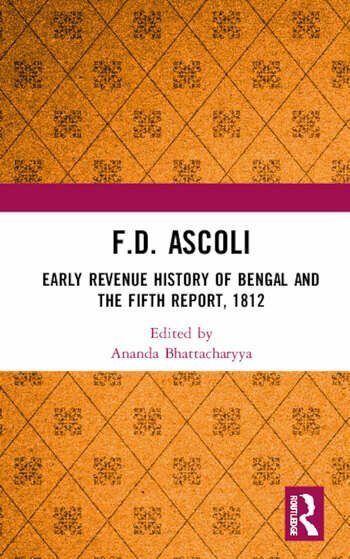 Mr. Ascoli's masterly analysis and partial text of the Fifth Report from the Select Committee, 1812, will be of material assistance to students of revenue history in Bengal and of Colonial India generally. F.D. Ascoli was born in August 1888 and got his education from Exeter College, Oxford. He was the Managing Director, Dunlop Plantations Ltd.; Director, Dunlop Malayan Estates Ltd. and Semtex Ltd. He entered Indian Civil Service in 1907 and held the post of Secretary, Board of Revenue, Bengal, 1917-20. He was also the settlement officer of Dacca. He retired from Indian Civil Service in 1926. Ananda Bhattacharyya is Assistant Director of the West Bengal State Archives.